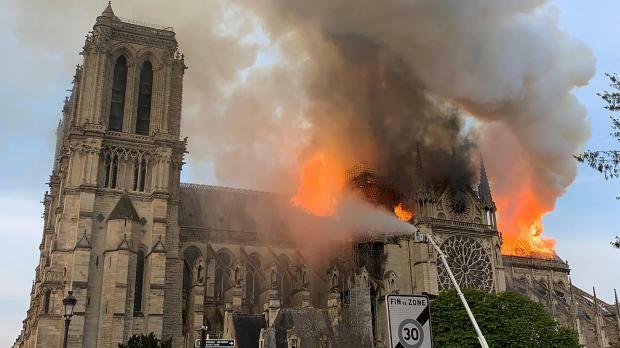 The spire of the 12th century cathedral has collapsed. Emotions show on the faces of the crowds gathered to watch the disaster. Firefighters still hoped to save the bell towers. Over 400 firefighters sped to the blaze. 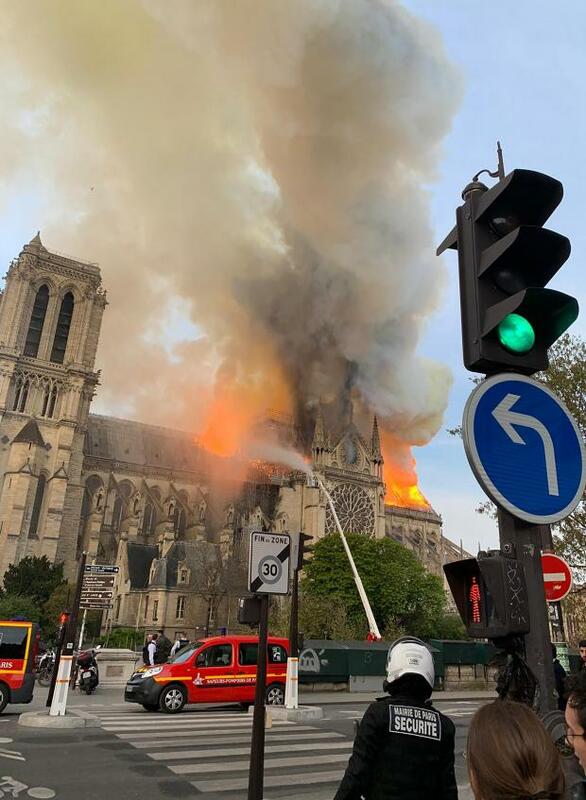 A major fire broke out at Notre-Dame Cathedral in central Paris on Monday afternoon, sending flames and huge clouds of grey smoke billowing into the sky, and devastating the 13th century landmark. 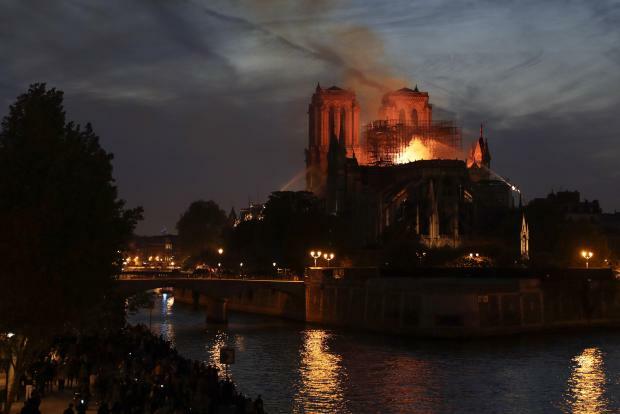 The flames and smoke plumed from the spire and roof of the gothic cathedral, visited by 13 million people a year, where €11 million renovations are currently underway. The spire and parts of the roof collapsed as the blaze roared, with flames higher than surrounding buildings. 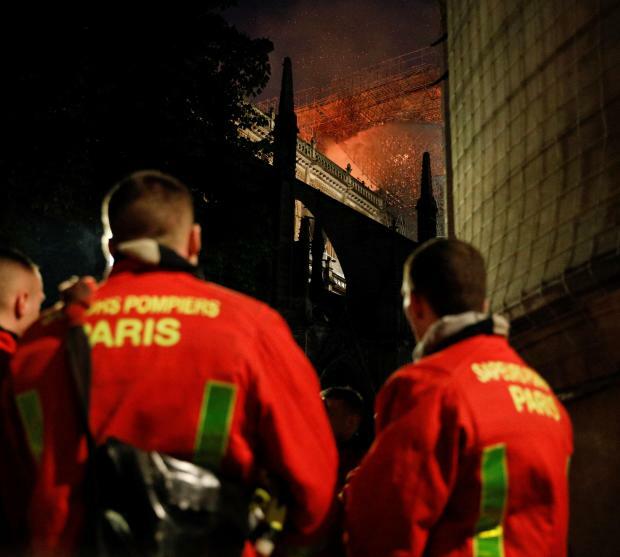 Around 400 firefighters were dispatched to the blaze, according to the French Interior Ministry. Police drones showed the extent of the blaze. 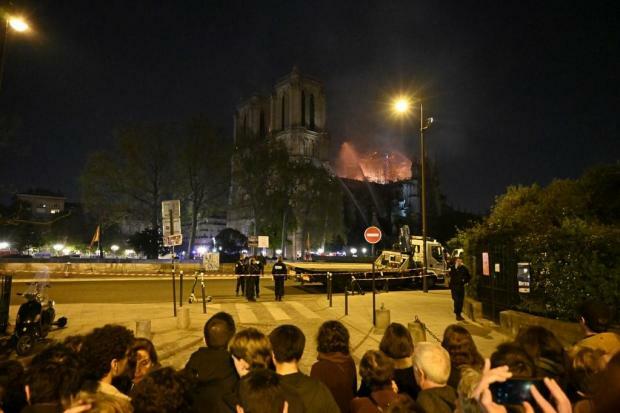 A spokesman for the cathedral lamented at 8.40pm on French media that nothing would be left of the building's wooden frame. By 9.55pm, the fire services said they were "not sure" that the fire could be controlled. They had earlier explained that it would not have been possible to drop water onto the structure as this would have resulted in the collapse of the entire building. The focus - after the spire collapsed - was to save the two bell towers. "It's not certain we'll be able to halt the spread toward the northern bell tower. If that collapses, you can imagine the extent of the damage," General Jean-Claude Gallet said. French newspaper Le Figaro reported that many of the cathedral's treasures were in a vault which should have protected them from the fire. The moment the spire came crashing down. 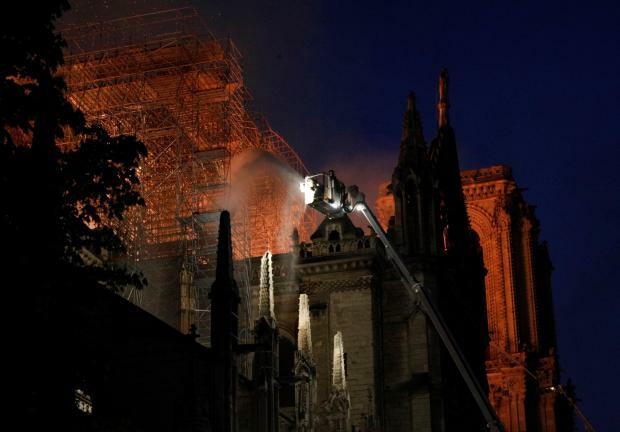 The United Nations' cultural agency said less than two hours after the fire started that it "stood at France's side to save and restore" Notre-Dame cathedral, "a priceless heritage". Read about some of the cathedral's priceless treasures here. 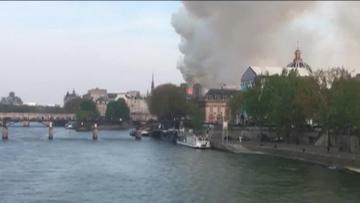 Fire trucks could be seen minutes after the fire broke out just before 7pm, speeding through Paris towards the scene on the Ile de la Cite - an island in the Seine at the heart of Paris. President Emmanuel Macron has cancelled a major policy speech, which he was meant to deliver this evening, his office confirmed. Reactions almost immediately poured in from around the world. Germany lamented the huge fire, with Chancellor Angela Merkel's office calling the building a "symbol of France and of our European culture". 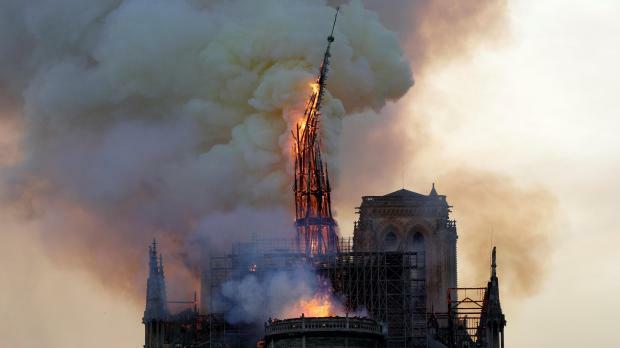 "These horrible images of Notre-Dame on fire are painful," Merkel's spokesman Steffen Seibert said on Twitter. 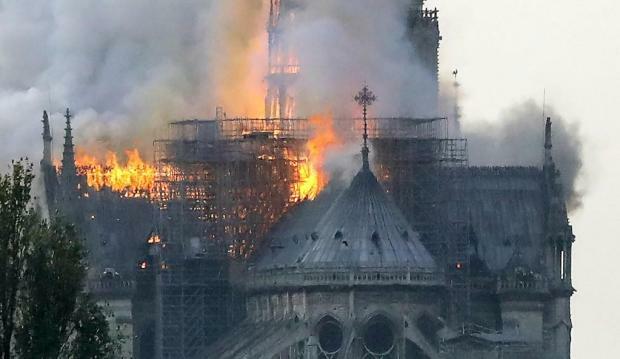 "Notre-Dame is a symbol of France and of our European culture. Our thoughts are with our French friends." London mayor Sadiq Khan also reacted, saying London 'stands in sorrow with Paris'. Prime Minister Joseph Muscat also tweeted that not only France and Europe had lost - but also humanity, a sentiment repeated by Foreign Minister Carmelo Abela in his tweet. 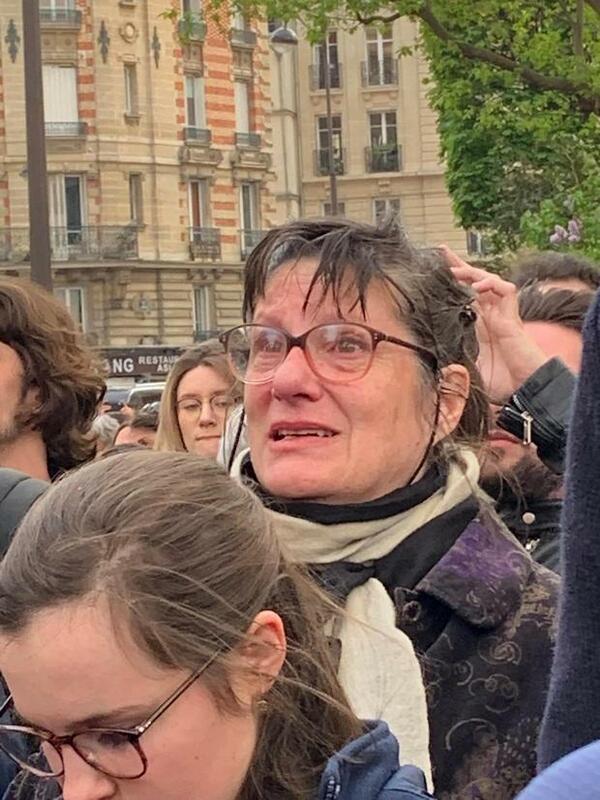 Crowds of stunned Parisians and tourists - some crying, others offering prayers - watched on in horror as flames engulfed the Notre-Dame cathedral. 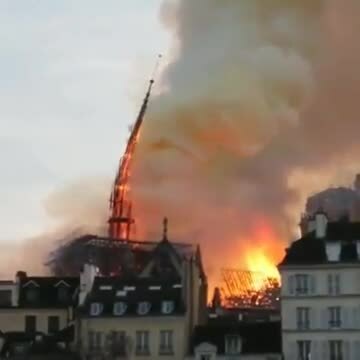 Gasps and cries of "Oh my god" erupted at 7:50pm when the top portion of the church's spire came crashing down into an inferno that spread to the entire roof. As the fire raged, groups of people did indeed kneel down to pray and sing hymns. Police were attempting to clear pedestrians away from the two islands in the river Seine, but throngs of onlookers kept trying to approach, snarling traffic as they massed on the stone bridges leading to the islands. Notre-Dame Cathedral is a medieval Catholic cathedral on the Île de la Cité in the fourth arrondissement. 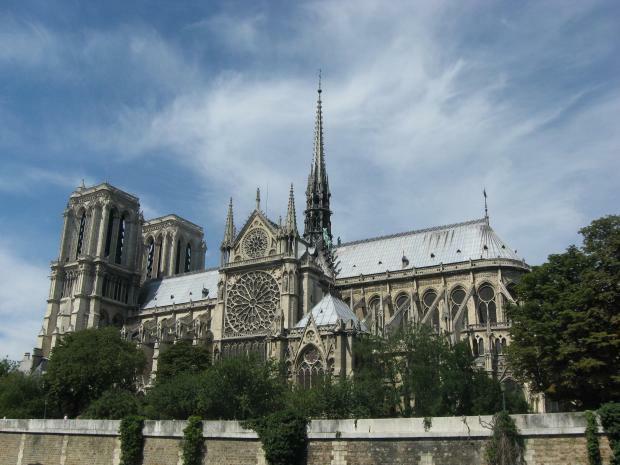 It is considered to be one of the finest examples of French Gothic architecture, and contains numerous works of art. The cathedral - which was constructed using considerable mounts of wood - was begun in 1160 and largely completed by 1260, though it was modified frequently in the following centuries, according to Wikipedia.